What does that mean, “wake up in your bathtub”? Was he too drunk to find the bed? Or did the woman have roommates? Knowing Lloyd Cole, it’s probably a “Norwegian Wood” reference. He’s a guy who likes references! Elsewhere on this song we have shout-outs to Bruce Springsteen, Howard Zinn, TS Eliot, Johnny Thunders, Franz Kafka, and an obscure (to me) Scottish record label from the 80’s. It’s been a while since I had to Google something from a song lyric. You may have noticed this, but I sometimes like to piece together the implied narrative behind cryptic-but-allusive song lyrics. Were I doing that here, I might come up with something about an ill-fated graduate love affair between and Englishman and an American woman. But really, this is just a joyful celebration of extended metaphor, in this case higher education as a stand-in for relationships. The song’s narrator tells us he is taking a break from his women’s studies…and what a clever way that is to describe being alone after a break-up! Their overly polite post-split conversations have the hushed tones of a library and display “campus etiquette.” He says he wrote his dissertation on the “barstools of [her] neighborhood,” and that the rented rooms where he now lives are his “bachelor’s degree.” There’s more, lots more. It’s as though Lloyd is channeling Elvis Costello back in his wordplay-drunk, pun-obsessed “Get Happy” heyday. The song comes from Lloyd’s new album, “Standards,” which was released last year in the UK and last month here in the US. It’s a really strong effort, especially from a guy 30 years and 20 or so albums into his career. The other standout song to my years is “Myrtle and Rose,” a meditation on love sustained over time, of two people together and apart and together but always proximate, emotionally if not geographically. “The longer you were gone the less the longing,” Lloyd sings, heartbreakingly. You don’t believe him for a minute. But he does tell her goodbye at the end of the song anyway. Take a listen on Youtube, or better yet, buy the album. 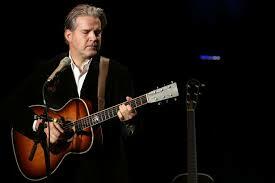 Because I worry about Lloyd Cole’s finances. How the heck does he make a living? These records can’t sell much. Does he play 300 nights a year of solo shows? Are they well enough attended to keep him in drinks and smokes? I doubt it. Plus he has a wife and two kids, he needs to be home sometimes. Are royalties from his first, best-selling album “Rattlesnakes” (which is awesome) still coming in? Does he have a guitar company sponsorship? If I care so much, I should probably contribute to his inevitable Kickstarter campaign, but I’d rather buy him a drink. I have a feeling he’d be crabby and guarded at first but by midnight be unreeling one great story after another. In the meantime keep the songs (and references) coming, Lloyd!